Chicken Tacos Recipe - Chicken is always topper recipe for non vegetarian people. Its tasty and healthy to eat. You will never find any people who don't love to taste chicken among non veg peoples. Recipes Cave sharing a lot of chicken recipes here as like series of recipes. So today we are going to share another chicken recipe that will help you to cook at your home. 2. Generously brush butter onto both sides of the tortillas. 3. Using a circular cookie cutter or a mason jar lid, cut the tortillas into small circles. 4. Flip a 12-cup muffin tin over and place a cut-out piece of tortilla in the space between two cups, so that they make a mini taco shape. One muffin tin will fit 17 mini tacos. 5. Bake for 5-8 minutes, or until just turning golden brown and crispy. (Times and temperatures may vary based on oven.) Make sure to check on them every couple of minutes to make sure they don’t burn. 6. Shred a rotisserie chicken, removing all bones and skin. 7. 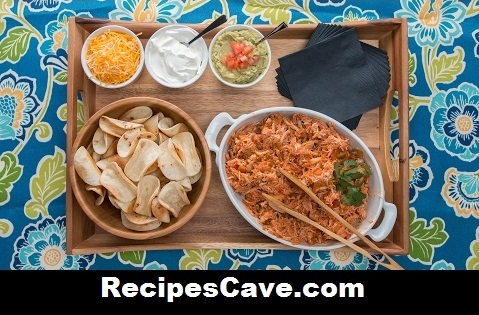 Place shredded chicken in a large pan over medium-high heat and add salsa. Stir well to combine. 8. Serve along with your favorite taco toppings. your Chicken Tacos Recipe is ready to taste.